On the tour for October 19 two more writers with a crime connection chalked their names on the mean streets of Hammettville: Judy Meliner and T.J. Mitchell. 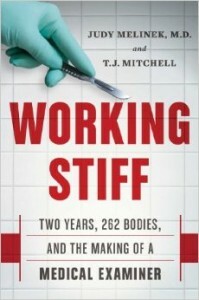 One book out so far, non-fiction, on the corpse trade — with plans for fiction. Noble lineage. Quincy. Bones. Ducky. I’ve met MEs and coroners before — the late great Boyd Stephens notable among them. Somewhere around here I have some photos of me Dr. Stephens shot, in full tour regalia, hat, trenchcoat. Maybe not the most lively-looking poses ever recorded, but, hey. The majority of his photographic subjects didn’t move around much. Yep, lots of writers have done the tour. Willeford. And Ace Atkins. And David Drake. To name a few. This entry was posted in Lit, News, Tour, Willeford and tagged Ace Atkins, Boyd Stephens, David Drake, Judy Meliner, T.J. Mitchell. Bookmark the permalink.